Home » Astronomy , NASA , Nebula » Amazing Nebula discovered by NASA -a Christmas find? 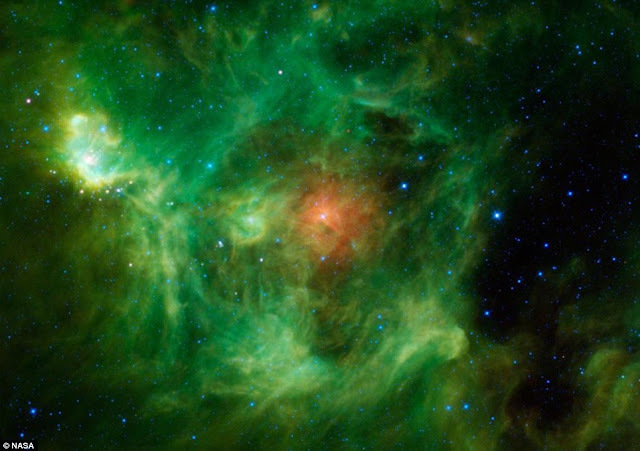 Amazing Nebula discovered by NASA -a Christmas find? NASA's Wide-field Infrared Survey Explorer (WISE) is getting into a festive mood this Christmas after imaging a beautiful nebula called Barnard 3, or IRAS Ring G159.6-18.5. Nicknamed the "Wreath Nebula" by mission scientists, Bernard 3 does have some familiarity with the green and red wreath hanging peacefully on your neighbor's door. But looks can be deceiving. The scene looks like a ring of evergreens decorated with a red Christmasy bow with silver bells throughout. It was captured by NASA's WISE space telescope.